I love breathing new life into thrift store finds. Let’s take this from daggy to delicate. I found this 1970s cloche with real taxidermy butterflies & yellow flowers. This looks straight out of grandmas house. Instead of passing it over I wanted to bring it up to date & into my house. Taking this nostalgic relic into modern decor was a fun project over my morning coffee. I found vintage magnolia flowers at the same thrift store which was serendipitous to say the least! Delicacy is key when dealing with real or taxidermy butterflies as we all know. I cut the petals around the butterfly and they gently peeled off of the old hot glue. Whew!!! The wood at the bottom already had drilled holes so after I removed the old cheap flowers I replaced with my magnolias. I had to put the glass dome on a few times to make sure the flowers were at an appropriate height and width. 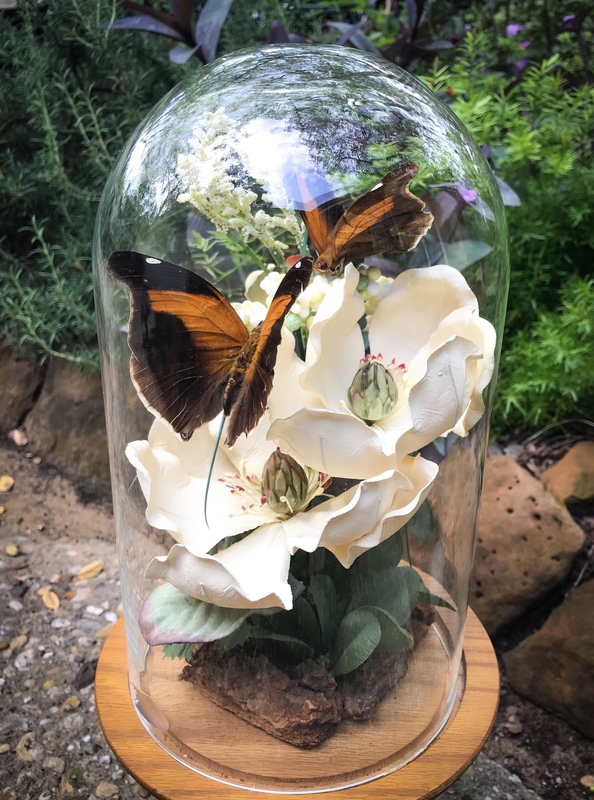 Then I chose the location for my butterflies making sure they would clear the glass dome & hot glued them in place. Finally I painted the base a vintage shabby chic white. I’m very happy with the end result! I think I’ll keep my eye out for more!! Join my Facebook group Coffee Craft and share your own up-cycled decor. Super cute and totally you!